I have been in Torrey for 2 and 1/2 years, yet I have never had a chance to really read one of the books written by our namesake. I went to the library last night doing research for a Torrey session when I realized this reality. I quickly went on the library website and looked up what books we had on him. I surprised to find so many. Being a Torrey students I really don’t have time for long books outside of classes, but I did want to read this one. When I got back to my room I started reading it and found great wisdom. I now see more clearly why the honors institute at Biola is named after him. I would like to share some thoughts from his book with you. I have only read the first chapter so far, but will soon read through the rest. Torrey interlaces Scripture frequently to support his points as he draws the Christian to the idea of the importance of prayer. This is just the beginning. We are to be alert because there is a devil. We must pray frequently for “All the mighty men of God outside the Bible have been men of prayer. They have all differed from one another in many things, but in this they have been alike.” (Torrey 8). Not only have men of the faith prayed, but the one in whom we have faith prays. He prayed upon earth and now “praying is the most important part of the present ministry of our risen Lord.” (Torrey 9). Torrey was so blown away by this idea that not only does Christ still pray for us, but that it is his main ministry now. 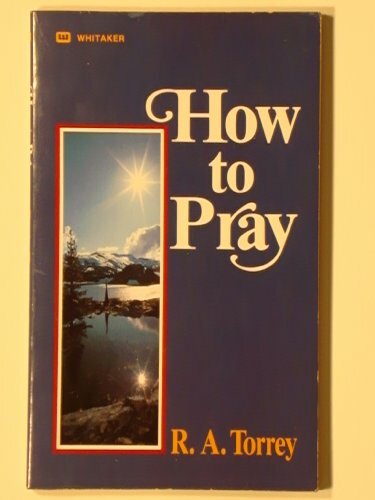 He writes that “I know of nothing that has so impressed me with a sense of the importance of praying t all seasons- being much and constantly in prayer- as the thought that this is the principal occupation of my risen Lord even now.” (Torrey 10). Prayer is not a flippant thing, for the creator of the universe is invested in it right now. One thing to note: the Torrey Memorial Bible Conference this year was themed around The Sabbath Soul. We will remember that we live in the seventh day of creation, the day of rest. We live in the rest of the Lord. He is Lord of the Sabbath. What does this mean in regards to prayer? Torrey talks about how prayer takes up time and energy, as seen in Scripture. Yet at the same time it gives us rest. Going back to Torrey, he says that “One night of prayer will save us from many nights of insomnia. Time spent in prayer is not wasted, but invested at big interest.” (Torrey 15). Here he is talking about worrying and how prayer gives us rest in that. I love how he says it is not time lost, but an investment with great returns. I talked about how time is my idol in a previous post. This line helps me view prayer in a much greater light. I have always talked about how God is with me in my Torrey paper. When I pray to him I can work much faster and better. Prayer increases my efficiency and abilities. This line is saying that prayer is an investment in itself, with great returns. We will receive even more through prayer if we invest in it. Why? Because we are praying to God our Father who desire to give us more. Torrey talks about how we do not have because we do not ask. God will give us what we need, we just need to ask him and not grow weary. Torrey mentions how we must always be in prayer, as the Bible says, but what about the busy worker? Even as we work on our homework, deal with coworkers, go to class, sleep, whatever we do, we must mingle prayers into our lives. As I prepare for quizzes and tests today, I will be in prayer. Torrey also shows how prayer is the way to joy for us. He says “there is no greater joy on earth or in heaven than communion with God.” (Torrey 13). How true this is! Prayer is merely communing with God, talking to Him. what great joy we should find in this truth as believers who can and should and must pray at all times! Torrey also writes on how prayer is the “vehicle for the Holy Spirit” (15), it prepares us for his return as nothing else does, and why we need to pray. We must pray of what it accomplishes as it causes spiritual growth,brings power into our work (such as raising children, as he mentions), helps the conversion of another (as seen in his own conversion and that of St. Augustine. He mentions how Monica, Augustine’s mother, pleaded with him, to no avail, but her prayers resulted in his turning to God), and to bless the Church. That’s good. Even as a student I have to make sure I am interlacing prayer throughout the day. That’s great. Sometimes we forget to pray for missionaries, and we probably rarely pray for them as they are working.